Do you live in Omaha or in a nearby city? Do you love golf? 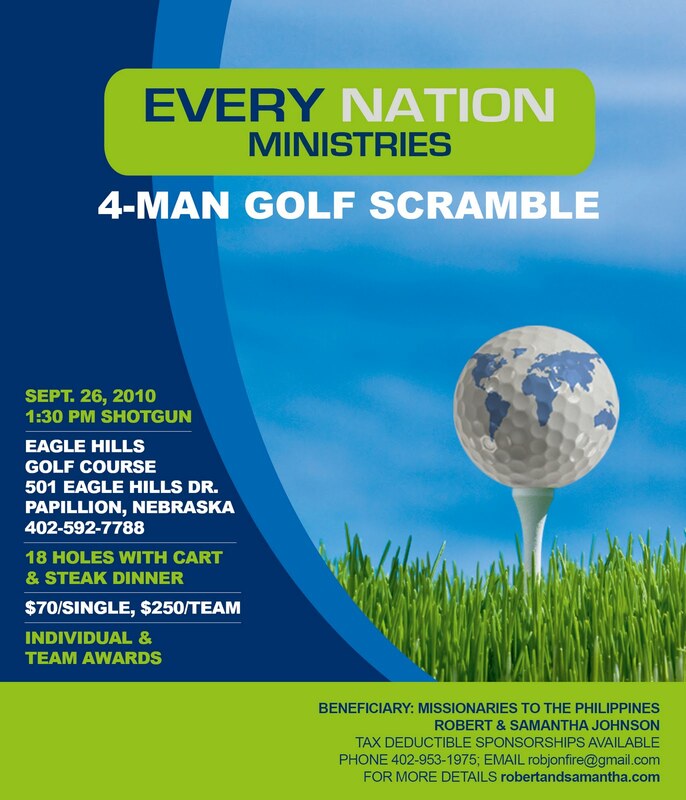 I would like to take this opportunity again to personally invite you to a golf tournament that my husband Robert is organizing. For more details, please a look at the official poster below. If you are trying to play golf before it gets too cold, this is a great opportunity to do so. But more importantly, it is going to benefit something that we clearly know God has called us to do in the next couple of years. My husband is in ministry full-time and is currently a missionary to the Philippines. I have a full-time job in web marketing but I also have the heart in helping him reach out in the city of Metro Manila. This golf tournament will help us raise funds for the next chapter of our assignment in the Philippines. We are set to do missions work in Manila for the period of January 2011 until July 2013. If you would like to know what we exactly do there, please click on this link. The money that we get to raise during our trip here in the United States will help towards expenses such as housing, transportation, health care, Bibles, books, local missions trips, sports programs, outreach activities, mentoring/counseling sessions and other open doors that will allow us to reach out to lost souls, empower the next generation of leaders, and help the poor. 1) Play a round. I am not sure how many gorgeous days we have left in Omaha that is perfect for a golf outing. If you want to go out and have fun -- this is an awesome opportunity. And you are helping lives in the process! 2) Form a team. The more the merrier! You save on the registration fee if you decide to create a 4-man team. 3) Volunteer. We need people to help us spread the word and make the event run as smoothly as possible. We could use the extra hands and smiling faces! 4) Donate. If you are physically unable to play or volunteer but have the heart for the nation, donations are welcome! You can either donate prizes (which will be given away in a raffle) or sponsor a hole (any amount will do!). A PayPal donate button is available at the end of this blog post. 5) Pray. We need people who can pray with us that the weather will be great, that people will enjoy their time at the event and be blessed to see what God is doing in the Philippines. Thank you for taking the time to read this specific blog post. It means a lot to me that you care enough to hear about our journey here. Be blessed today!